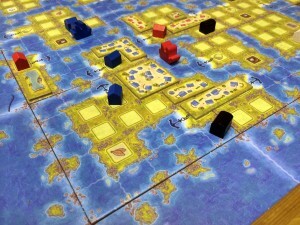 Amerigo is a game by Stefan Feld – a designer who has created some great game such as Bora Bora, Rialto, Trajan, Strasbourg, Die Speicherstadt to name just some that I’ve reviewed. Like two other Queen Games (Shogun and Wallenstein), Amerigo uses a cube tower – a card tower with couple of card sections inside (like floors in a building) which have various holes in them. When cubes are dropped into the tower, some come out at the bottom and some are retained inside the tower on the card layers (which may fall out when more cubes are dropped into the tower later). Made up of multiple tile sections, the board show grids of land and water spaces and, together, form islands. During the game, players explore and colonise islands by moving their ships, setting up trading posts and building villages. Players score Victory Points (VPs) for building villages, gathering goods (and increasing the value of their goods), developments, etc. The game lasts 5 rounds (each divided into 7 phases) and the player with most VPs at the end of the game wins.